I haven't had a "Fun and Free" post in quite a while even though we do a lot of fun and free stuff. I am going to make a dedicated effort to post more free activities for both kids and grown-ups as they cross my path. I've got another Fun and Free post planned for later this week, assuming we all survive the activity (and the mallet). This is not a new idea, not even a new twist on an old idea. 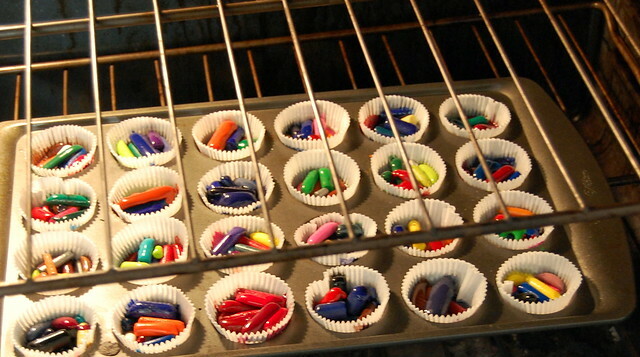 But it's a good idea, and a great way to use up crayon bits and all those broken pieces the kids find so unappealing. I've attempted this before, using the microwave, and failed miserably. So miserably that I've never ever wanted to try it again. Yesterday, however, I came across this post and decided to give it a shot, figuring if it was a complete failure at least I could toss the crayons out in the paper liners - much easier clean up than the last attempt at this (it was so bad I've blocked most of it from my mind). I won't go through the steps, the linked post does that very well (with super pretty pictures), but will add a few notes. 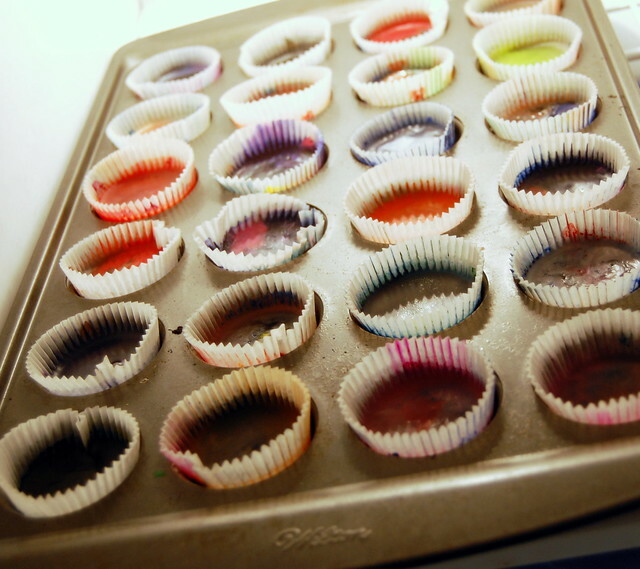 The only ingredients/materials needed are crayons of any shape, size, condition, and color, muffin tins, and muffin tin liners (might work without the liners, after freezing the crayons peeled off the paper very easily), an oven, and a freezer. 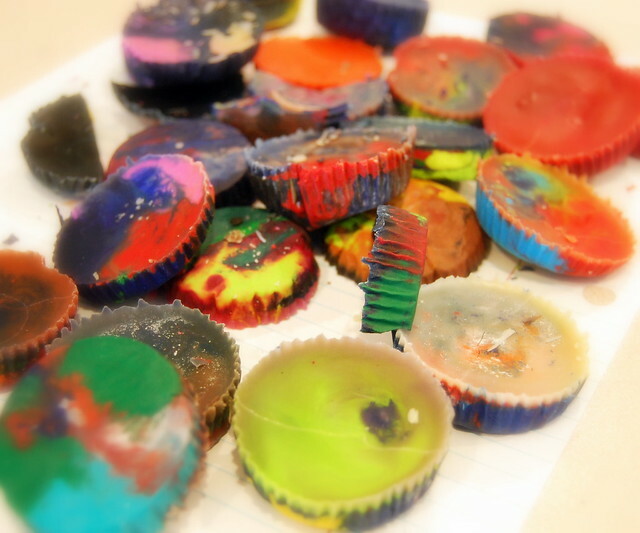 Our melted crayons cracked and broke in half after they went into the freezer. That was just fine, they were easier to grip and and to color with. I'm not sure what caused the cracking but I'm guessing the sudden change from the heat of the oven to the cold of the freezer. We used too much black, which we won't do in the future, it overpowers the other colors. We didn't pay too much attention to what crayons were being mixed together, which I would certainly do differently next time - I'd love to have a pink/yellow/orange mix and a green/blue/turquoise mix. One of the kids did an all blue mix and, while it sounded kind of humdrum, it was really neat to color with because it changed shades often and unexpectedly. While we were finding crayons in the bottom of our bucket and then peeling a bunch I talked up the colors as much as I could, "Look at this little pink crayon tip", "I wonder who took the wrapper off this big bright blue crayon", "How many greens pieces have you found? ", and "Let's read the label and see what they call this blueish purple". The same held true when we colored at the end - lots of color talk and comparisons. 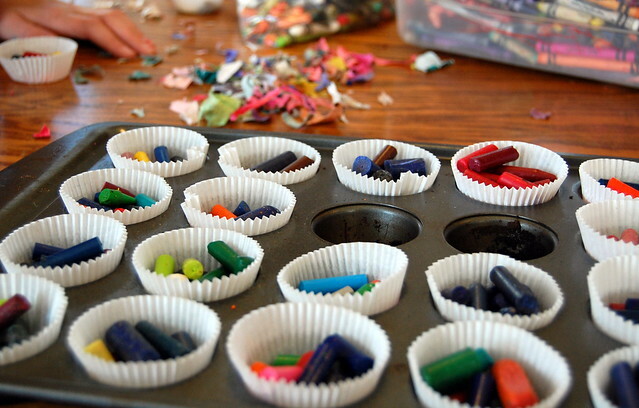 The little ones helped as much as they wanted to - they were welcome to try to peel the crayons, crack them in half, and/or place them in the muffin tins ... one of the blessings of this project is that there is no right or wrong unless you really want it done a certain way, giving the younger ones a great opportunity to do what the big kids are doing. 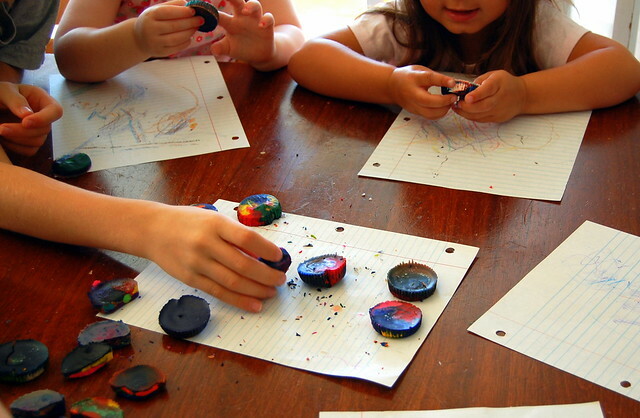 So glad you gave the confetti crayons a try! Yours look great too. Thanks for the link.